Recently I had a chat with Janak Patel (we did an interview a while ago which you can check out here - Janak Patel Interview. Janak is a smart dude and was talking about the rising competition and rising costs of getting clients from Facebook. His solution has been to use LinkedIn, and the results he is getting are pretty awesome. He’s been using LinkedIn to generate over 1287 leads per month with Zero advertising costs. The clients he is attracting are affluent professionals who could actually afford high priced training services. He showed me the proof with screen-shots of his connections growing by the 1000’s every month and how the engagement level of his content is through the roof. Most social media like Facebook and Twitter are predominantly designed for socialising, but people on LinkedIn are there to network and pay for anything that will advance their career or make them money. The psychology of people on LinkedIn is different, which makes it easier for personal trainers to get paying clients. Many on LinkedIn are also busy professionals which mean they are well suited to the time efficiency and convenience of having an online trainer rather than face to face. Janak has created an amazing course detailing exactly how he does this and how other online trainers can do the same thing. I love big courses but I also love getting you guys education for free so I asked Janak if he would put together a free mini course to show you how to use LinkedIn to attract clients into your online fitness business. 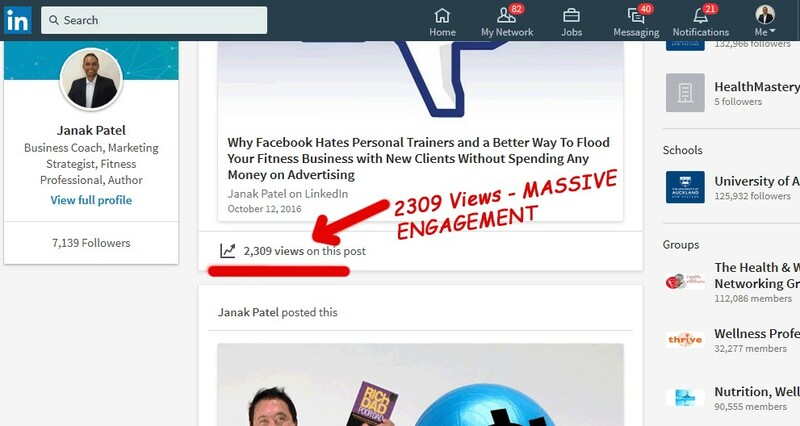 - How to use LinkedIn to effectively to generate highly qualified leads for your fitness business every month with zero ad costs. - 2 professional markets you can start targeting today. - How you can target the corporate market for wellness programs. - How most PT’s are using LinkedIn the wrong way and how to do it right. So, while I would never suggest you stop using Facebook to get clients I think this course can provide some great insight in to a social media platform that may be better for getting paying clients in to your services. I highly recommend you check it out as it could be a great way to get new clients in to your online personal training business...... And, it's free!https://janali.leadpages.co/linmastery-optin-ptdistinction.